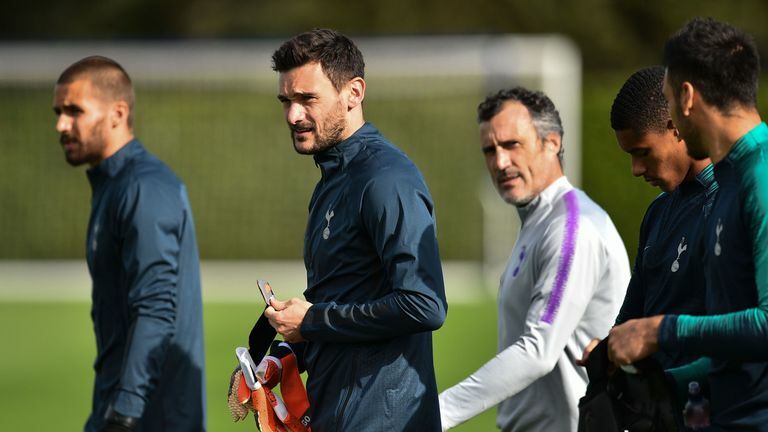 Tottenham manager Mauricio Pochettino has defended goalkeeper Hugo Lloris and still believes he is “one of the best goalkeepers in the world”. With Spurs leading 2-1 at PSV Eindhoven on Wednesday night in the Champions League, Lloris was sent off in the 79th minute after rushing out of his area and taking out Hirving Lozano. PSV equalised eight minutes later with many blaming the Frenchman for the eventual 2-2 draw which leaves Tottenham winless in this season's Champions League and staring at an early exit from the competition. But Pochettino has stood by his captain and is not concerned by his performance in the Netherlands ahead of the Monday Night Football against Manchester City, live on Sky Sports. Asked how Lloris is, Pochettino said: "He's very good. He's disappointed like all the team because I think we deserved more in that game. "I promise you I haven't read [this criticism of him]. I don't know. "In football you can be good then sometimes not so good but for me Hugo is one of the best goalkeepers in the world. "He was man-of-the-match against West Ham a few days before PSV, but he's not guilty of the result in PSV. "In football this can sometimes happen - for me it wasn't a sending off, it wasn't a yellow card but at the end we draw the game and it puts us in a very difficult situation to qualify for the next stage of the Champions League. "But Hugo is an important player for us, he's our captain and [I have] no doubts about him." Lloris has had a troublesome few months on and off the pitch since lifting the World Cup in Russia as France captain in July. The 31-year-old pleaded guilty to one count of drink-driving in September after admitting to being more than twice the drink-drive limit when he was stopped in the early hours on August 24. He was fined £50,000 and banned from driving for 20 months. Lloris then missed six games in September with a thigh injury and made a mistake on his return to the team in the 4-2 defeat to Barcelona in the Champions League at Wembley as he rushed out for Philippe Coutinho's early opener. "I'm being so objective: he's one of the best, for sure," Pochettino said. "He was very important in games like against Newcastle, Fulham, Manchester United and West Ham. We won all of these games and was one of the best payers on the pitch. "He didn't play against Watford, Liverpool and Inter Milan, and we lost those games. "In football we have a short memory and I remember after Watford [hearing] 'Oh, we miss Hugo'. We have short memories - against West Ham I think a big percentage of the victory was because of Hugo, he was unbelievable and his performance was brilliant. "But we need to find someone responsible when you don't win but the responsibility is mine and if we don't win, I'm the first to blame, not the players. "When you play football you can make a mistake but it's about the attitude and for me the whole squad have shown a fantastic attitude and we cannot blame one or another."